Want to lose some weight, but don’t really know how to start? A couple of years ago, I was in the same position. I was mostly sedentary, my waist measurement was creeping up steadily, and I didn’t feel very confident about my body being on display when I went on holiday. I got married a few years ago, and the breaking point for me was when I first had to buy a larger pair of trousers so I could wear the suit again for another event, and then, later, when even those trousers had started to cut into me. I decided that it was time to make some changes – and so I did. Today, I’m in a different position. It was my 36th birthday this month, and I was packing a suitcase for a holiday. I needed some shorts, and I managed to dig out an old pair I’d used a couple of years ago. I took a photo of myself wearing them now, without even stretching the elastic. Now, granted, the muscles don’t happen automatically; you’d need to do some weight training for those (you can read about my workout regime if you like), but you can definitely trim yourself down without needing to go for the full superhero look. I wish I’d had my Apple Watch when I started all this; it would have made things a lot easier for me in terms of tracking my exercise. You certainly don’t need one to lose weight, but it does simplify things, and it’s a great motivational aid – and it makes for a much more enticing article title (ahem). For best results, equip yourself with a gadget (like the Watch) that can measure your heart rate and active calorie burn, and let’s get started. If you don’t have such a thing, that’s fine; we can use estimates instead. Our bodies are burning energy all the time, and we need to consume calories (in the form of food and drink) to supply that energy. Sometimes, we’re consuming more calories than we’re burning, and in that situation you’ll gain weight. To lose weight, you need to figure out how many calories you need to consume for your current activity level, and then make some changes to your life so that you’re consuming fewer calories than that figure; i.e. to create a calorie deficit each day. You’ll then start to lose weight. The best way to create a calorie deficit is to do it on two fronts at the same time: eat a bit less, and exercise a bit more. Nothing dramatic, in either case: just some tweaks to your habits, that will pay dividends over time. It’s worth noting here that this is all very approximate, and you’ll find differing opinions on just about every figure, guideline, calculation, and so on. I don’t think that specifics are important; instead, the main thing is to set reasonable goals, and to have some way to compare how you’re doing as you go. 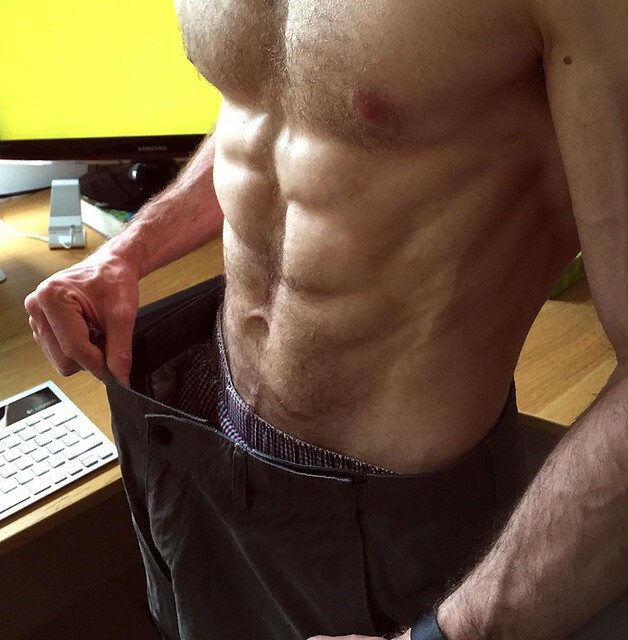 This has worked well for me, and I’ve never used personal trainers, nutrition plans, diets, or anything like that. By all means check with a professional – they’ll know more than I do – but I think that you can go a long way without asking someone else. I know I did. Lastly, an obligatory bit of common sense: before embarking on any big changes to your diet or exercise habits, it’s always wise to check with your doctor. I won’t be suggesting any big changes here, and you’ll be going at your own pace, but it can’t hurt to get the nod of approval from someone with a medical degree. I’m going to assume that you’re using a Watch and an accompanying iPhone here. If not, just keep a note of the relevant info somewhere convenient. The first thing to do is enter your personal information into the Health app on your iPhone. This info lets the device make more accurate calculations about how many calories you’re burning. All of the info goes into the “Health Data” tab. Input your gender and age into the “Me” section. Input your height and weight into the “Body Measurements” section. Next, find somewhere to track your calorie intake and burn each day. I use a simple spreadsheet, since it can do calculations for you and immediately show the results. Any spreadsheet will do: Numbers on the Mac or iPhone, Excel on your PC, Mac, or mobile device, Google Sheets in your browser, OpenOffice, or any other similar app. I use Numbers. We need to work out your daily resting calorie requirements, which is easy to do. Your requirements depend on your age, gender, weight, and height, so it’s worth getting a number that’s specific to you. We’ll use a quick online calculation to get the right number. We’ll do this in two simple steps. First, we work out your Basal Metabolic Rate (BMR), which is just the number of calories you’d need to consume each day if you did absolutely nothing – like if you literally lay in bed all day, without getting up. We burn calories all the time, even lying in bed. You can use an online BMR calculator to find your rate, and all you need is your height, weight, age, and gender. For example, I’m a 36-year-old man, 5’6” tall (or short, I suppose), and I weigh about 9st (126 lbs). That gives me a BMR of about 1,444. Go and work out yours, and note it down. Next, we use your BMR to work out your daily resting calorie requirements. It’s a simple estimate, and all we have to do is multiply your BMR by a resting “activity factor”, using what’s called the Harris Benedict Equation. The factor you want is 1.2. Multiply your BMR by 1.2, and you’ll get your daily resting calorie requirements. For me, that’s 1444 x 1.2, which gives me 1,733 calories. I’ll call this my DRCR for convenience. But what does that mean? 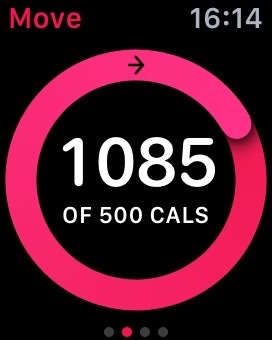 Put simply, it means that, if I do absolutely no exercise at all, I’ll need to consume 1,733 calories per day in order to maintain my current weight. That’s a key point: your DRCR is your break-even level, where your weight will remain roughly stable, without exercise. Make a note of your DRCR somewhere, like in your spreadsheet. Your DRCR is an important figure. We’re going to use it each day to measure against what we actually eat and how much exercise we do, and to set goals for losing some weight. We now know our daily resting calorie requirements, but we probably don’t know exactly how many calories we’re actually consuming. We’re going to track those from now on, just roughly. Read the nutritional info on food packaging. Search the web for “<name of food> calories”. Use an app, which is probably the best option. MyFitnessPal is really good. It can scan barcodes, and remembers common things you eat too. During the day, keep a note of everything you’re eating and drinking (you’ll probably remember anyway). At the end of the day, convert all of that into a total number of calories. That’s your intake for the day. We all tend to eat fairly repetitive diets; I usually have the same thing for breakfast each day, then one of a few lunches, then one of a few pretty common dinners. Because of those patterns, after the first few days, it’ll be a very quick process to work out your intake for the day. One tip is to keep a record of your own most common meals (which MyFitnessPal will do, as I said), then you can just fill the number in without having to look it up ever again. I use an extra sheet in my tracking spreadsheet for my common foods. Just don’t go crazy about accuracy; the important thing is to just have a rough idea of what’s going on. Each night, take a look at your intake. Subtract your daily resting calorie requirements (DRCR) from your intake (i.e. Intake minus Resting), and you’ll see your position for the day – assuming you’ve done no exercise. If the result is negative, you have a calorie deficit, and if you maintain that deficit over time, you’ll lose some weight. More likely, though, the number will be positive – which means you’ve eaten more than you’ve burned. That’s how you gain weight. But we haven’t accounted for exercise yet, and that’s where your Watch comes in. The really nice thing about the Watch is that it tracks your activity level using everything from its accelerometer and pulse sensor, to your iPhone’s GPS and barometer. It gives a pretty damned good estimate of how many calories you’re burning – particularly since it also knows your age, gender, height, and weight via the iPhone’s Health app. Particularly usefully, it tracks not only your active (exercising) calories, but your resting calories as well. So if you have a Watch, you actually get a much more accurate DRCR every day to use in your spreadsheet, instead of just using the static figure we calculated earlier. If you need to charge the Watch during the day, do so during inactive periods, like when you’re eating lunch, or in the shower after a workout. A quick 30-minute boost is best, then put it back on. You want it tracking you for as much of your day as possible. Always start a workout on the Watch before you do something reasonably active. Cycling, running, and that kind of thing obviously count, but so does a ten-minute walk. Doing a few push-ups in the house, wandering around the shops, playing sports – it all counts. Tell your Watch when you’re starting an activity, and remember to stop the workout program when you’ve finished. If you’re doing something active where you can’t wear the Watch (like swimming, probably, though some people do still wear it), just keep note of how long you’re performing the activity, and how hard you were working. Later, search online for a reasonable estimate of the calories you burned, and add them to your spreadsheet at the end of the day. Again, don’t worry about being super-accurate. 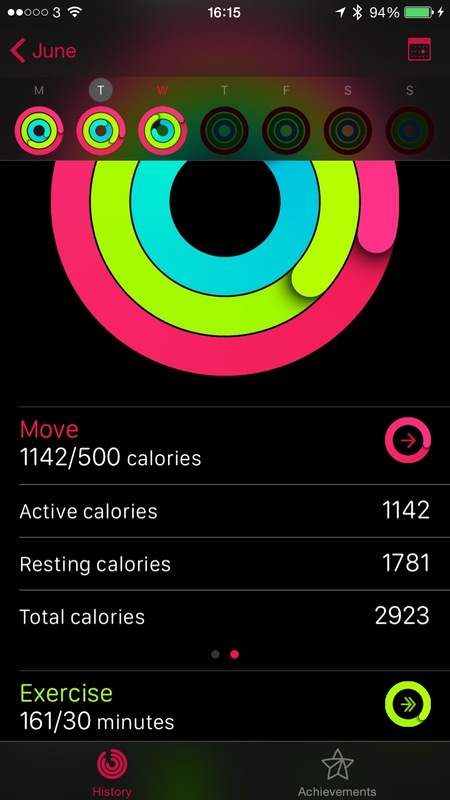 Your Move figure, in the Activity app on your Watch or iPhone, which is also called active calories. Your resting calories – which you can find in the Activity app on your iPhone (not Watch), by swiping the Move graph for today. Hopefully that’s logical to you. Your total number of burned calories is the sum of resting (just going about your life, fuelling your body’s normal needs), and active (when you’re actually exercising). We subtract that total from what you’ve eaten, to figure out where you are for today. If you don’t have a Watch, use the DRCR figure we calculated earlier as your resting number each day, and make appropriate estimations of the calories you burn during exercise by searching online for the type of exercise you did. Don’t worry too much about accuracy; comparing day-to-day is the important thing. Remember to check your current status at the end of the day, because you’re burning calories all the time. I do it before I go to bed, just before I take off my Watch. As I said before, your current status might be either positive (you’ll gain weight), or negative (you’ll lose weight). Since you’re reading this article, you probably want it to be negative. But negative by how much, and how exactly do we make it negative? Let’s talk about that. Everyone wants to lose weight quickly, but let’s be realistic: that’s probably bad for your body, and it’s really hard, and it involves making such big changes to your life that your motivation is going to be low. So forget that. Instead, I’d advise taking it slowly. Ease into it. My strategy is simple: eat a bit less, and exercise a bit more. It sounds achievable, and it is. The best weight-loss plan, after all, is the one that you’ll actually stick to. It’s up to you whether you want to set a goal (like a target weight). I didn’t; I just wanted to like what I saw in the mirror, and to feel good about my body and my fitness. We don’t even have a set of bathroom scales in the house at all. But maybe you’ll find it helpful to be able to have a concrete number to work towards, and to measure against – it’s your choice. If you do want a goal, you might choose one based on a weight you used to be, when you felt more comfortable. Or, you could find out what weight you’d need to be to have a healthy Body Mass Index (there are lots of online calculators for that). Or maybe you just want to lose a set number of pounds, to begin with. In any case, I’ll leave that figure up to you. The way we’ll get there is by creating a calorie deficit every day. We’ll eat a bit less, and exercise a bit more, such that our Current Status number is a little bit negative each night. By doing both things at the same time, you not only increase your general fitness with the exercise, but it also means you don’t need to make such big changes to your diet. Before we go any further, here’s the most critical point: you have to create a deficit below your daily resting calorie needs. If you’re currently eating more than your resting needs (without exercising), you need to decrease your intake (and/or increase your burn) so that you not only break even, but are actually in deficit. I just want to make it clear that the deficit is below your basic needs, not just below what you’re eating right now (which might be more than your requirements). That’s logical, if you think about it. That’s how you lose weight. The two remaining questions are: how much of a deficit should I aim for each day, and how do I do that? We’ll deal with those one by one. Your daily deficit is based on how much weight you want to lose, and how quickly you want to lose it. My advice, again, is not to rush. It’s commonly said that to lose 1 lb of fat, you need to create a deficit of 3,500 calories. While it’s absurd to think that the actual figure doesn’t vary enormously depending on hundreds of different individual factors, all we really want is a rough number to work with. As with everything else here, you pick a figure that seems sensible, go with it for a while, see how you’re doing, and make changes appropriately. You’re a unique individual with a unique and incredibly complex body. Just pay attention to it, and tweak your plans accordingly. Hopefully that’s obvious. With that said, I see no reason not to start with the often-quoted figure, for planning purposes, so let’s go with 3,500 calories per lb. The thinking here is that, for example, if you wanted to lose 1 lb in 7 days, you’d need to create a daily deficit of (3,500 / 7), or 500 calories. Now, don’t do that, because a 500-calorie-per-day deficit is quite a lot, particularly if you’re just getting started. You have to consider your daily calorie requirements, and pay attention to what percentage of your resting needs you’re trying to have as a deficit. You shouldn’t overdo it. You’d be better off starting with about 15%-20% of your resting needs. For me, that’d be around 350 calories per day. Since we’re using the 3,500-calories-per-lb figure, it’d then logically take me ten days to lose 1 lb, if I maintained that 350-calorie deficit every single day. Reality, as ever, is more complex – but we just want something to aim for. My advice to you is to pick a target daily deficit that’s around 15% of your daily resting needs, and see how it goes for a while. Remember that the important things are to be consistent, stay motivated, not push yourself too hard, and to see some results in a reasonable amount of time. One important thing: don’t let your overall current status get too low; you need energy to survive and stay healthy. Just listen to your body, and don’t rush. So that’s how you work out your deficit; now, we’ll talk about how to get there. As I’ve said, we have two approaches that we’ll use simultaneously: diet changes, and exercise. Cutting down on alcohol. A bottle of beer is 170+ calories. A single UK measure of neat spirits is 70+ calories. If you’re drinking regularly, cutting back a bit will have a big impact. Quitting the sugary drinks helps a lot too. “Diet” versions of soft drinks are controversial because of the artificial sweeteners used, but you’ll certainly be skipping a load of calories. A regular can of Coke has 140 calories, whereas Diet Coke has only 1 calorie per can. Water, the better choice, has zero. If you have three Cokes a day, switch them to Diet (or water), and you’ll immediately have dropped 420 calories. Done. Cut down on carbohydrates (carbs). Carb-heavy foods include bread, potatoes, pasta, rice, pizza, rolls/panini/burger-buns, and things like that. In each case, brown variants are generally better for you than white ones. If you’re having a curry, choose either rice or naan bread, not both. If you’re having a burger, try leaving the top part of the bun. If you’re making spaghetti bolognese, use half as much pasta, and fill it out with some salad stuff. No big deal. Chocolate bars. They’re delicious, and I love them, but eat them in moderation. Each one is in the 220-260 calories range, usually. Skip one each day for appropriate savings. You don’t have to make huge changes; just pay a bit more attention, and whittle away a few calories when you can. It all adds up. By the way, some things may surprise you in terms of their fat and sugar content, despite seeming to be “healthy” (and indeed being basically good for you). Fruit, for example, has a lot of sugar, and nuts have a lot of fat. Coconut is pretty heavy, calories-wise, and many muesli/breakfast bars can rival chocolate for their calorie content. There are healthier options available; your supermarket may have a healthy foods section, but still check the label. Regardless of your calorie situation, try not to eat too much sugar, salt, or saturated fat. Check your government’s recommend daily allowances. Being in deficit doesn’t change the advice on those limits, even if you can ‘afford’ the calories. You don’t have to suddenly explode into strenuous physical activity; just step it up a notch from where you are right now. Aim to split your target deficit between food and exercise: say a couple of hundred calories worth of each, if that. It’s completely manageable at that level, on both counts. There are lots of ways to get 150 or 200 calories worth of exercise in a day. My advice to you would be to set aside some time and go for a walk, or even two smaller walks. Thirty minutes in the morning, and thirty at lunch – or morning and evening, or whatever works for you. Go at a reasonable pace. You don’t need to run, but swing your arms. Move with purpose. You can easily cover three miles in a total of 60 minutes (broken up during the day if necessary), and you’ll likely burn 150 calories or more. Your Watch will tell you how you’re doing, and if you need to burn more calories in the same amount of time, try walking a bit faster, or take an uphill route. Just don’t push yourself too hard. If you usually take the car short distances, try walking instead. If you commute via car, consider cycling, even if it’s not every day. I work from home, and I have an indoor bike in my office that I use every morning. Most enjoyably, consider taking up a sport of some kind: there are endless options. You could also go for a ten-minute run, and see how you feel. Similarly, your local gym has a variety of interesting machines to try out, including bikes, steppers, and elliptical trainers. You can ask someone if you’re not sure how to use them; people are always glad to help. Keeping your brain occupied makes exercise go faster. Listen to music, or podcasts. Watch TV. If you’re on a stationary bike, read a book or your Kindle. I have my laptop set up on my indoor bike. Just find something that distracts you a bit. 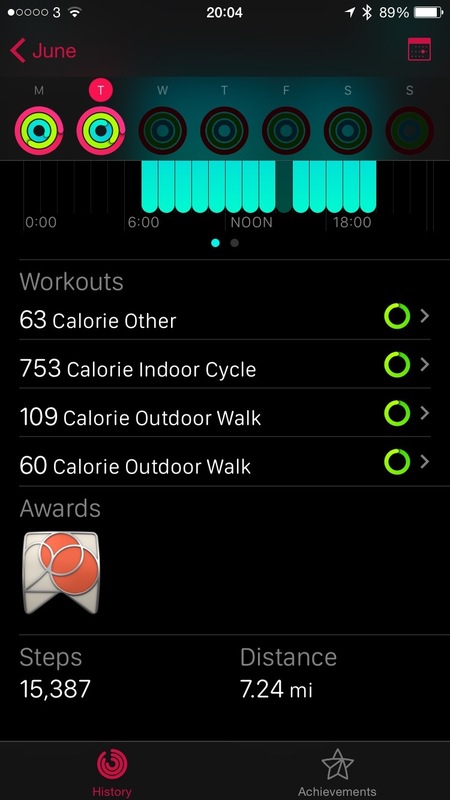 At the end of the day, you can review all of your workouts in the Activity app on your iPhone. Again, the goal is simply to contribute to your daily deficit a little; 150 or 200 calories will do just fine, and you can make up the rest with some simple diet changes. You can reach that number more easily than you think. It all counts. The key to any enterprise is consistency, and the easiest way to promote consistency is to maintain motivation. You won’t be motivated if you’re listless, hungry, and irritable – so go at your own pace. You should make an effort, but I’d advise you to choose sustainability over speed every time. Life is to be enjoyed. Adjust things based on how you’re feeling. A bit of hunger isn’t a bad thing (many of us would benefit from becoming reacquainted with hunger), but feeling faint or unwell isn’t OK. Don’t push yourself too hard. You’ve got plenty of time. If you’re sick, take the day off. Don’t feel bad about it. Rest up today so you can get straight back into it tomorrow, or the next day. Take a break from exercise one day per week. Similarly, don’t beat yourself up about the occasional pig-out day. Consistency doesn’t mean an absolutely unbroken record. Just follow your plan most days. We’re all adults here, and you’re not training for the Olympics. Spread your deficit goal out over a suitable amount of time, and don’t let your intake get too low. This probably won’t be a problem for most people, but some (like me) can get obsessive about it. Take your time. Sudden major changes are much harder on you and your body. Remember that your intake and burn are balancing forces. If you do a lot more exercise without increasing your intake, you’ll be in a bigger deficit. Just keep an eye on things, and don’t let the balance swing too far either way. After substantial changes to your body weight, remember to update the Health app on your iPhone, and/or re-do the calculations for your daily resting calorie requirements. Your requirements will go down as you get lighter, so you’ll want to decrease your intake (and/or increase your burn) to compensate. Updating the figure once every couple of months is probably fine, unless you’re losing weight really rapidly. It’s not an exact science, so don’t become a slave to the bathroom scales. Your weight fluctuates based on lots of things, include hydration, whether you’ve been to the toilet recently, and whether you’re menstruating. Also, being bloated can make you look like you have more stomach fat than you actually do. Checking your weight daily is pretty much useless; go for once a week, or once every two weeks instead. Do it at the same time of day each time. Personally, I don’t bother. Technology can be a huge help, and I’d have had an easier time during the last couple of years if I’d had the Watch to keep track of my burn, and nudge me to keep going. Not wanting to lose any ‘Stand’ hours has become a pretty powerful motivator to get out of bed, strap the thing to my wrist, and start moving. Ultimately, though, your main source of motivation will be yourself, and your desire to feel better, and be more comfortable with what you see in the mirror. That’s certainly what pushed me to make those changes in my life, and it’s still what drives me, every day. You don’t have to switch to rabbit food, or twist yourself into knots. You don’t have to be a sweaty mess, collapsed under the bench-pressing machine. You can if you want to, but you really don’t have to. All you need are realistic goals, and a reasonable plan that you can follow. If you stick with it, you’ll get there – and still be able to enjoy life along the way.